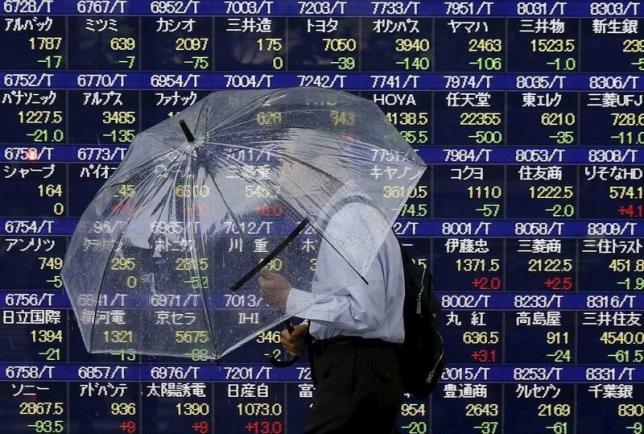 TOKYO – Asian shares rose modestly on Friday on relief the Federal Reserve held off on raising interest rates but gains were capped by renewed concerns about the health of the global economy, in particular China. The dollar was on the defensive, having fallen more than 1 percent after the Fed’s decision, while U.S. bond yields plunged, erasing their sharp rises in the past couple of days. MSCI’s broadest index of Asia-Pacific shares outside Japan rose 0.3 percent, led by financials, although Japan’s Nikkei average fell 1.4 percent, tracking losses on Wall Street. Fed Chair Janet Yellen said the outlook abroad has appeared to become less certain, adding that recent falls in U.S. stock prices and a rise in the value of the dollar already were tightening U.S. financial market conditions. “I think today’s decision will prove positive for markets in the end. But volatility is likely to remain high as markets, like the Fed, will still have to confirm the U.S. economy is withstanding the adverse impact from the global economy,” said Yoshinori Shigemi, global market strategist at JPMorgan Asset Management. Analysts and traders had been nearly evenly split on whether the Fed would raise rates for the first time in nearly a decade, though markets had priced in only a one-in-four chance of a hike. The Fed’s fresh economic projections showed 13 of 17 policymakers still foresee raising rates at least once in 2015, down from 15 at the last forecast made in June. Financial markets, which have constantly forecast a far slower pace of policy tightening than the Fed’s projections, were less convinced. Instruments such as federal fund futures <0#FF:> and overnight indexed swap are pricing in only about one in two chance of a rate hike by the end of year. For the Fed to raise rates, Yellen said she wanted to see more improvement in the U.S. labour market and expressed concern over weak inflation. Referring to the global outlook, Yellen explicitly said the central bank was focussing on the slowdown in China and emerging markets, saying one key issue is whether there might be a risk of a more abrupt slowdown in China. “Yellen specifically mentioned China as a key influencer in their decision. This means China and its regulators are now in the driver’s seat and that isn’t a thought that brings down uncertainty – quite the contrary,” said Asia-Pacific managing director at risk management firm Axioma in Singapore. The spectre of lingering uncertainty, some traders say, could be one reason risk asset markets were mixed. “Going into the Fed’s meeting, there were three scenarios. A rate hike and dovish outlook, no hike with hawkish comments and a no hike with dovish comments. People seem to think the result was no hike and dovish comments. Despite that, risk assets had a tepid reaction,” said a currency trader at a Japanese bank. “Looking at the way markets are reacting, risk assets could come under selling pressure again,” he added. As the prospects of higher interest rates down the road had been a major attraction for the dollar, the U.S. currency was wobbly against many other currencies. The dollar index against a basket of major currencies was little changed at 94.559 on Friday, having fallen to a three-week low of 94.360 on Thursday. The euro jumped to a three-week high of $1.14415 on Thursday before easing to $1.1403 while the British pound also hit a three-week high of $1.5628 before retreating a tad to $1.5575. The yen also edged up 120.12 to the dollar from Thursday’s low at 120.995. Longer-dated U.S. debt yields plunged, with the two-year note yield dropping to 0.682 percent, returning to its familiar range only a day after it hit a 4-1/2-year high of 0.819 percent. Commodity prices were relatively well-supported with U.S. crude futures last trading at $46.77 per barrel, down slightly from Thursday’s high of $47.71 but still up almost 5 percent on the week.